Campania, a region in southern Italy, known for its rich pastures and fertile land. 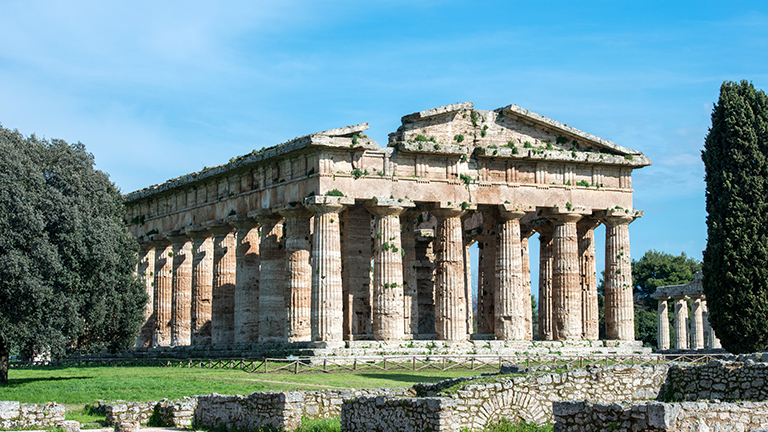 Campania represents one of the cradles of Greco-Roman culture, and definitely deserves a visit during your sailing holiday in Italy. Charter a yacht in Campania, drop your anchor in the Bay of Naples, and get ready to explore its edgy same-name capital. For history buffs, no trip to Naples would be complete without a visit to the infamous Pompeii and Vesuvius. 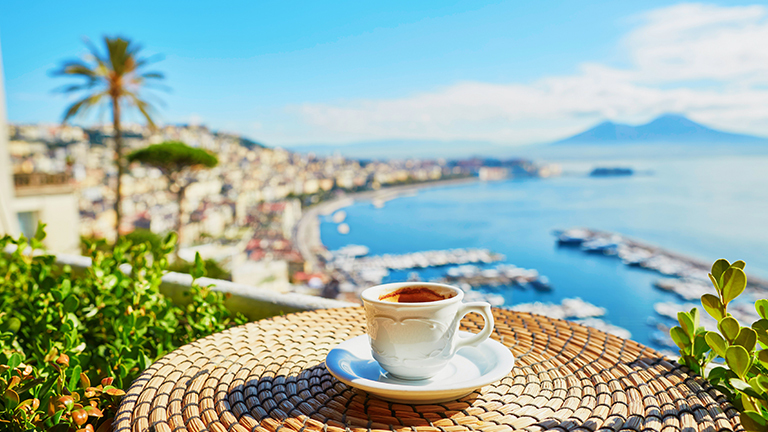 Naples is not only the birthplace of pizza (pizza verace napoletana), which is a must try, but is also known for its short and very, very strong coffee. After you feel energized, set the sails of your charter yacht towards the picturesque Procida, the smallest island in the Bay, just a short trip from Naples. You will be amazed by the tangle of houses painted in pink, yellow, blue and green rising above the azure sea. The obligatory part of sailing in Campania is the visit southeast to the spectacular Amalfi Coast, listed as a UNESCO World Heritage Site. It is also one of Italy’s top spots for hiking, most popular trail being the Path of the Gods. 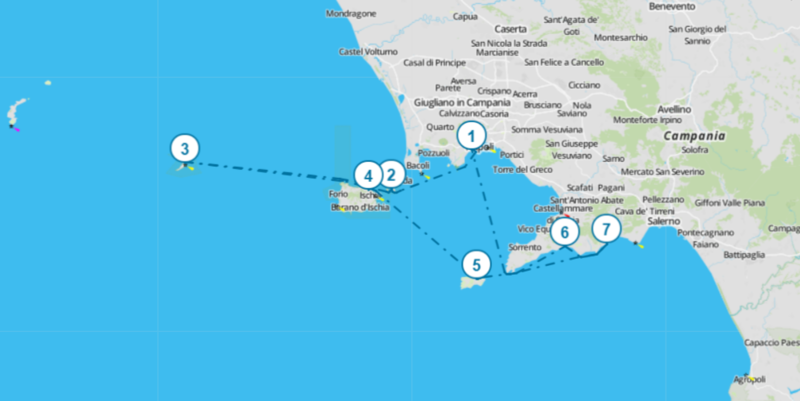 South of the Amalfi Coast is Salerno, a safe port where you can relax and go sightseeing - visit the Cathedral of San Matteo and theRoman aqueduct. 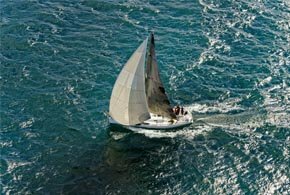 Best time for leisure sailing is without a doubt from April to June, if you want to avoid crowds and the oppressive heat of July and August. 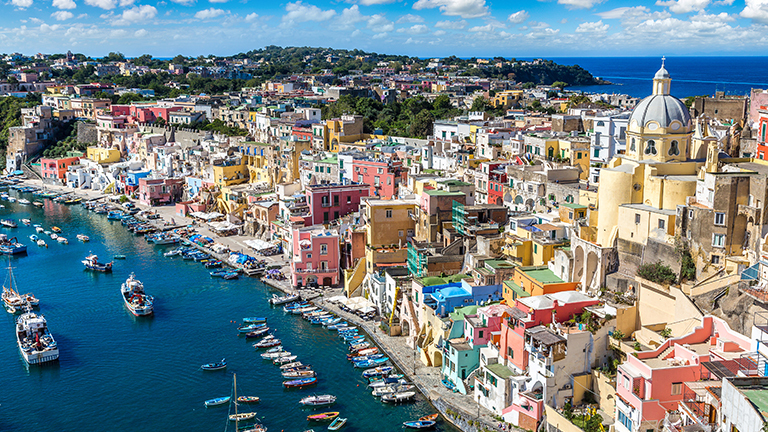 On the first day, leave the port of Naples and steer your boat toward the island of Procida. Dock at the Marina Chiaiolella. From the Marina, hop to the island of Vivara and take a walk around the National Park. Later, sail back to Procida and use the opportunity to explore the island on foot. Walk around the charming narrow streets and picturesque town squares and discover the rich architecture of Procida’s churches and abbeys. Use most of the day to bask in the sun at Pozzo Vecchio or Chiaiolela beach. In the morning, leave Procida and head west to the small island of Ventotene. Sail around and discover hidden caves, such as Grotta della Regina Giovanna, Grotta delle Mummie and Grotta del Vojo Marino. 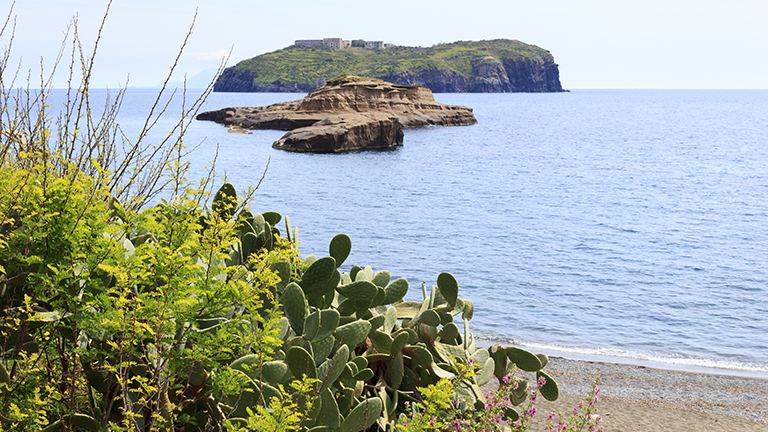 Once you tie your yacht in the marina, explore the Ventotene Natural Park for a little bonding with nature. After a lunch break at one of the restaurants with a beautiful sea view, continue to the town square to visit the archaeological museum and the Roman remains such as ruined, painted walls, baths. After some sightseeing, head to the Spiaggia di Cala Nave for some swimming and snorkeling while in the evening take a light stroll down Via Oliva. 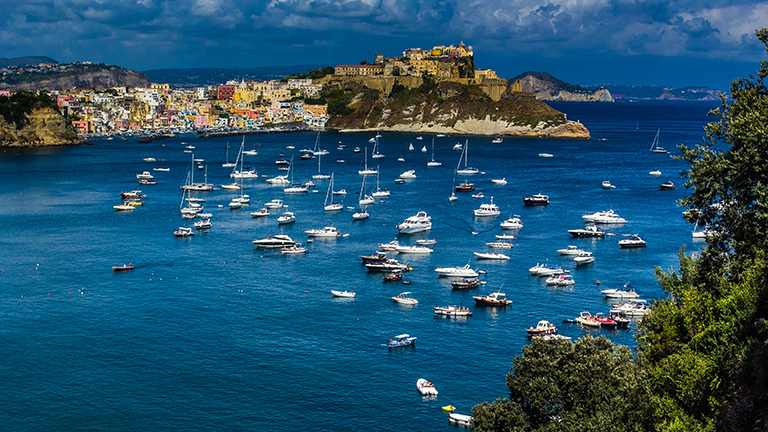 From Ventotene, embark back east to the port of Ischia, a volcanic island in the Bay of Naples. Sail around and feast your eyes on the island’s sandy beaches and clear blue sea and rest your bones at the island’s pleasant natural thermal springs and spa complexes. 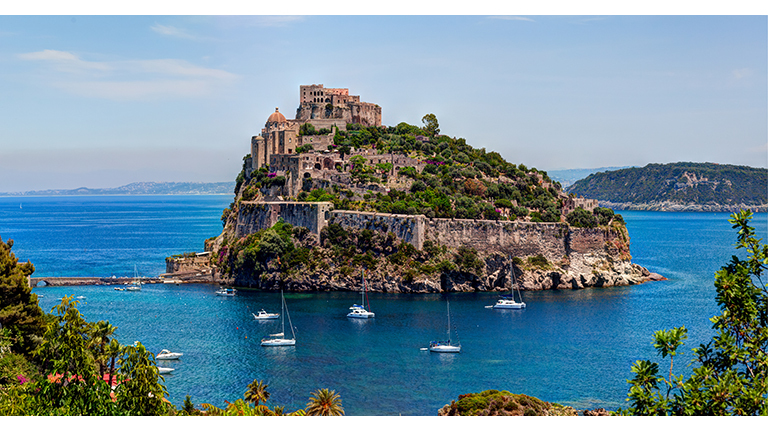 After you’ve built enough energy from the springs, go for a little cultural enrichment by wandering around Ischia’s museums and churches scattered across the six island settlements, followed by a little adventure seeking by taking a wine tour and trying out horseback riding. 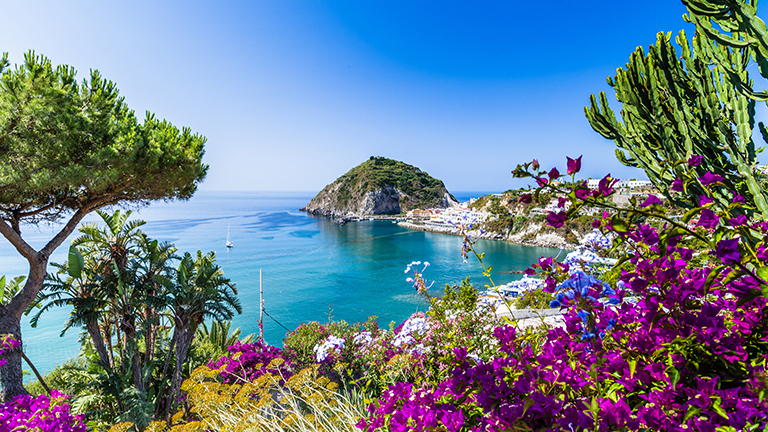 To round up a perfect day, visit Ischia’s numerous gardens famous for its tropical plants, resident peacocks and thermal pools. From Ischia, proceed sailing to the Marina Grande of Capri, the famous tourist attraction known for its natural beauties and classy settlements. Sail around the island’s rocky seashore and shingle beaches and you will soon discover Faraglioni, the island’s iconic rock formations and the hidden Grotta Azzurra. Dock at Marina Piccola and enjoy a nice meal with an exquisite view from the terrace of one of marina’s restaurants. 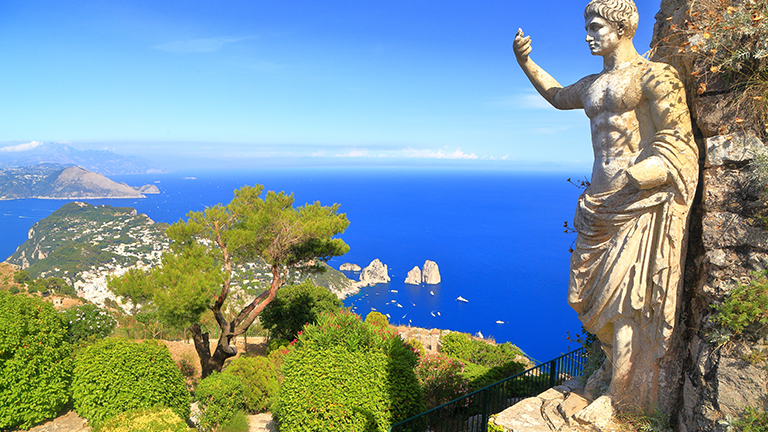 From the marina, rent a car or a scooter and continue your adventure by exploring Capri’s gardens and villas. When you reach the town of Capri, visit the Certosa di San Giacomo, an old monastery-fortress housing art exhibitions. Take a hike up the Phoenician Steps, which connect the town of Capri with Anacapri, all the way up to Monte Solaro for a breathtaking view of the island. Leave Capri behind and set out to the port of Positano on the Amalfi coast. Sailing towards the coast you will encounter the sights of rocky cliffs and dark pebble and sand beaches. Swim on the Spiaggia Grande and try the local seafood at one of the restaurants at the beach. From the Spiaggia, take a stroll down Via Cristoforo Colombo and navigate around the plentiful cafes and high-end fashion boutiques. Explore Positano’s cultural heritage by visiting its villas, palatial buildings and churches and be sure to visit the beautiful dome of Church of Santa Maria Assunta and Grotta la Porta museum of prehistoric remains. Rent a car or a scooter to the village of Montepertuso just above Positano for a quiet stroll along the olive groves. In the evening, season your stay by going out to the Music on the Rocks discotheque or Viale Pasitea for a more peaceful atmosphere where you will hear live Neapolitan music. 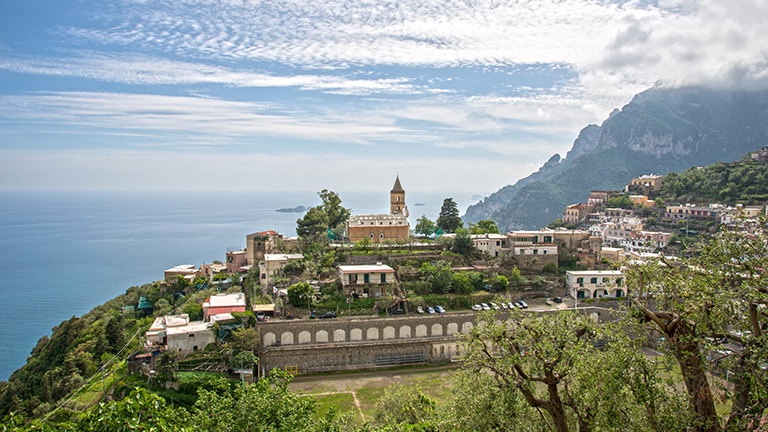 Continue your adventure along the Amalfi coast to the eponymous town and port of Amalfi. Start your day by discovering why this town has been declared UNESCO patrimony of humanity by visiting the central piazza and its Arab-Norman style Cathedral of St.Andrew, the nearby Cloister of Paradise and museum, housing relics of the town’s rich past. From the central square, navigate around the narrow white alleys, buy a souvenir at a local shop and sit down in a cafe for a limoncello, a strong local specialty. 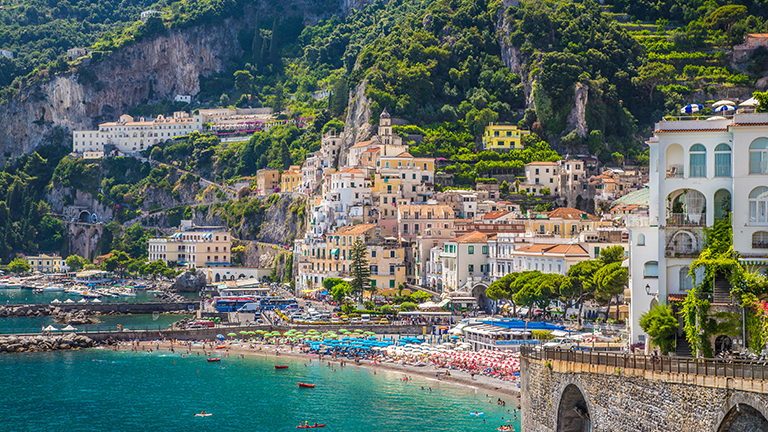 Use the afternoon to relax on Amalfi’s small beach or hop to the neighbouring Atrani, which is less crowded and try hiking up from Valley of the Mills to the Valley of the Ferriere, which are known for lemon groves and paper mills. In the evening, treat yourself to a pleasant stroll along the seafront and delight in the view. Leave gorgeous Amalfi behind, head back to the port of Naples, Italy’s third largest and one of the oldest cities. After breakfast and coffee, use Naples’ public transportation or rent a car to navigate around the town more easily. Visit the historical center of Naples, dating back to Roman times, which is now a UNESCO World Heritage Site. When you get there, explore the beautiful Cathedral of Naples and the adjoining crypt and museum. Use your lunchtime to taste Napoli’s specialties, such as pizza or eggplant parmesan with a sip of fine Neapolitan wine. In the afternoon, immerse yourself in a shopping spree in Via Toledo and Via Chiaia, main shopping streets in Naples. Afterwards, take a relaxing stroll down the seaside Via Caracciolo and visit the wonderful Castel dell’Ovo and Borgo Marinari. Your sailing experience of the Campania region begins in Salerno, the capital of the eponymous province. Begin your day exploring the historic centre and its churches, museums and art galleries. Be sure to visit the Salerno Cathedral and the Virtual museum of Salerno’s Medical school, the first medical school in the world. Come lunchtime, treat yourself to some typical Salernitana cuisine, rich in Mediterranean flavours of olive oil, fish and cheese. Afterwards, immerse yourself in the lush greenery of Salerno’s gardens and parks teeming with fountains, statues and busts of past times. In the evening, take a nice walk down the Promenade Trieste extending along the coast and try out what the local wine bars have to offer. 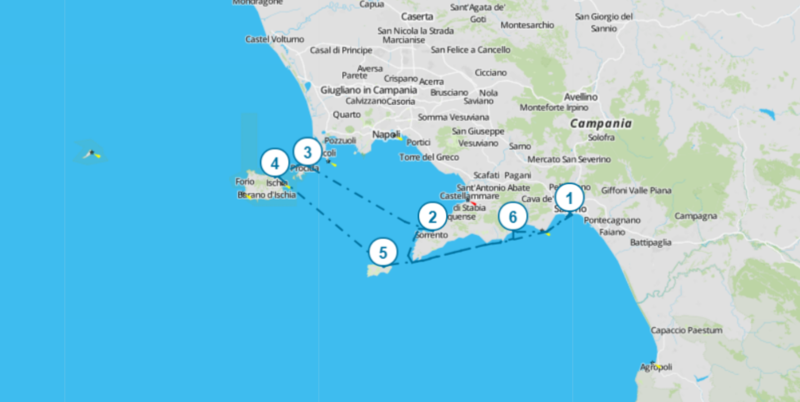 In the morning set out from the Marina “Masuccio Salernitano” to the town of Sorrento on the Sorrentine peninsula and tie your boat at the Marina Grande. Take a stroll down Corso Italia where you can do some shopping around local boutiques and later have a lunch break and a taste of limoncello, a famous lemon liqueur. From the Cathedral of Sorrento, continue sightseeing around the Old Sorrento, famed for its churches, palaces and museums. Be sure to try out hiking around the peninsula and use to chance to hire a local guide to show you around. Untie your ropes and set your course from Sorrento to the island of Procida, Marina Chiaiolella. Once you dock your yacht in the marina, use the opportunity to explore the island on foot. Walk around the charming narrow streets and picturesque town squares and discover the rich architecture of Procida’s churches and abbeys. Use most of the day to bask in the sun at Pozzo Vecchio or Chiaiolela beach. 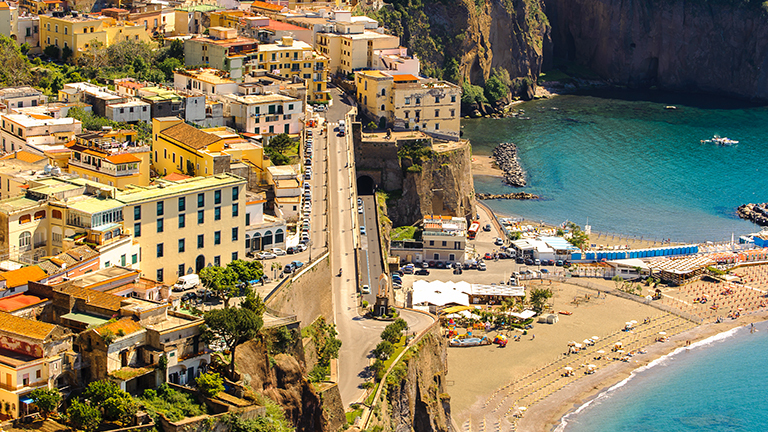 From Procida, embark west to the port of Ischia, a volcanic island in the Bay of Naples. Sail around and feast your eyes on the island’s sandy beaches and clear blue sea and rest your bones at the island’s pleasant natural thermal springs and spa complexes. The following day, proceed sailing from Ischia to the Marina Grande of Capri, the famous tourist attraction known for its natural beauties and classy settlements. Sail around the island’s rocky seashore and shingle beaches and you will soon discover Faraglioni, the island’s iconic rock formations and the hidden Grotta Azzurra. Dock at Marina Piccola and enjoy a nice meal and with an exquisite view from the terrace of one of marina’s restaurants. 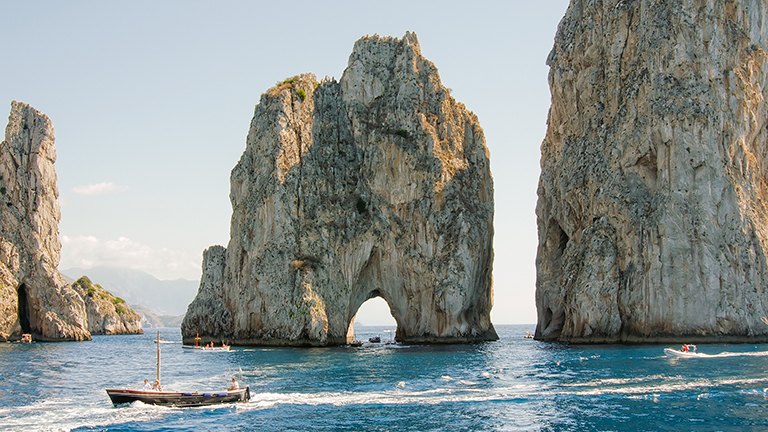 From the marina, rent a car or a scooter and continue your adventure by exploring Capri’s gardens and villas. When you reach the town of Capri, visit the Certosa di San Giacomo, an old monastery-fortress housing art exhibitions. Take a hike up the Phoenician Steps, which connect the town of Capri with Anacapri, all the way up to Monte Solaro for a breathtaking view of the island. 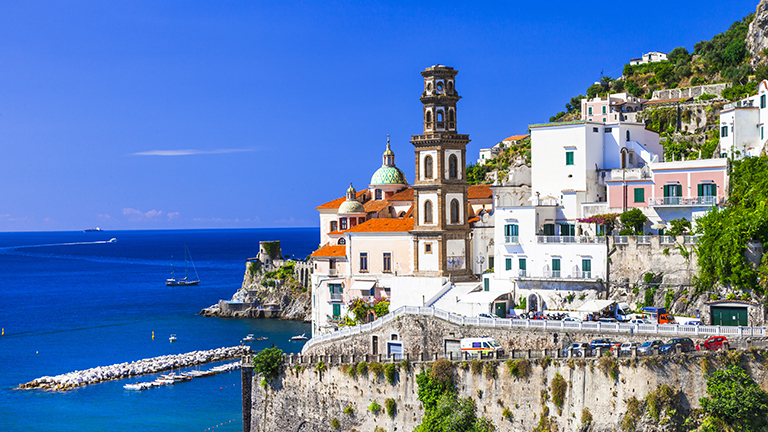 Continue your adventure toward the Amalfi coast and the eponymous town and port of Amalfi. Start your day by discovering why this town has been declared UNESCO patrimony of humanity by visiting the central piazza and its Arab-Norman style Cathedral of St.Andrew, the nearby Cloister of Paradise and museum, housing relics of the town’s rich past. From the central square, navigate around the narrow white alleys, buy a souvenir at a local shop and sit down in a cafe for a limoncello, a strong local specialty. 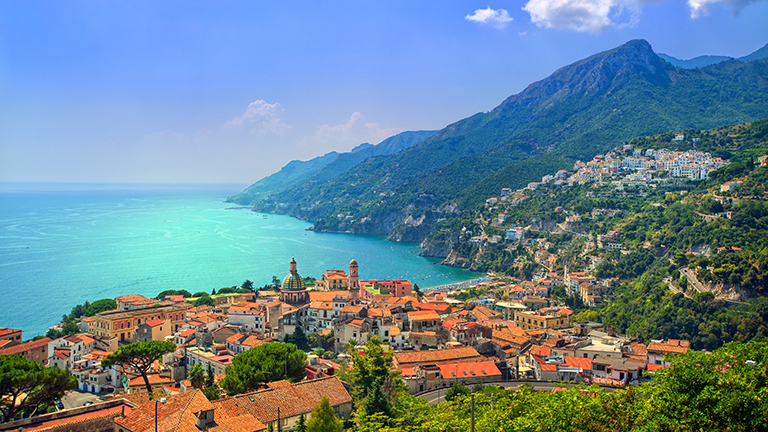 Leave Amalfi early in the morning so you can head back to Salerno and use some more time to do a quick sightseeing once more. Take a little stroll around the town’s historic centre before heading back to the airport. Interested in Sailing Holiday in Campania Region?